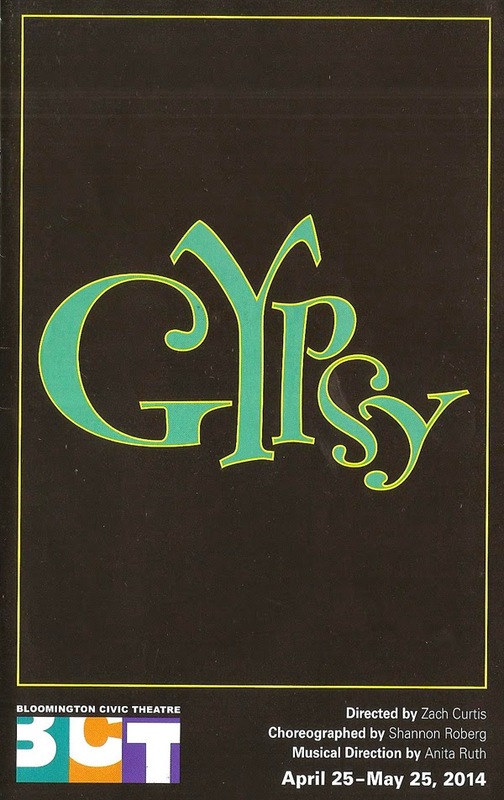 What better time to see the classic 1959 musical Gypsy than on Mother's Day weekend? Based on the memoirs of Burlesque star Gypsy Rose Lee, it features the quintessential stage mother in Rose, who puts all of her hopes and dreams into her daughters as she guides them through their Vaudeville career. There's nothing really new or noteworthy about Bloomington Civic Theatre's production, it's just a good, solid, classic interpretation of one of the best musicals ever written, full of great songs and complex characters. We first meet Rose and her daughters Louise and June in an audition, as she famously calls out directions including "sing out, Louise!" Baby June is the star, a pretty and precocious little girl in blond ringlets, and Louise is the older and less talented daughter forced into the shadows. Rose promises her girls she will make them stars, and travels around the country getting them bigger and better gigs with the help of Herbie, their manager who's also an unofficial husband/father figure to the family. Louise and June soon outgrow the little girl act but their mother refuses to let them grow up. A teenage June runs away with one of the boys in the act to form their own act. Herbie and Louise encourage Rose to walk away and concentrate on their family, but Rose is not someone who gives up. She turns all of her focus to making Louise a star in a recycled version of the old act. But Vaudeville is dying, so the act ends up in a Burlesque theater. Rose promises that this will be the last gig and she will marry Herbie and walk away when it's over. But when given the chance to make Louise a star in the Burlesque world, she takes it, and shoves Louise into the spotlight. Surprisingly, Louise takes to this new role and shines, not needing her mother any more. In one of the most famous musical theater songs, Rose makes one final plea to the universe, asking when it will be "Rose's Turn" after all she's sacrificed. Everyone in the cast (which includes a lot of new faces at BCT) does a fine job, but there is one star in this show and that is Sally Ann Wright as Rose. As one audience member behind me noted, "she's perfect for the role." With a strong voice and commanding presence, she simply is Mama Rose. Another who's perfect for the role is ten-year-old Dora Dolphin as Baby June. Already a veteran of Twin Cities stages (see also This Side of Paradise at the History Theatre and Collide Theatrical Dance Company's Belmont Hotel), the role of an adorable, precocious, talented young blond who's about to become a star is one she was born to play. Also great are Kristen Husby, who believably takes Louise from the tomboy-ish second fiddle to the elegant stripping star; Paul Reyburn as the solid and steady Herbie, the calm in the middle of the storm; and Martino Mayotte who makes a charming Tulsa and dances divinely on one of my favorite numbers in the show, "All I Need is the Girl." In one of the highlights of the show, the three strippers in the Burlesque club are all fantastic and play their "gimmick" well - Emily Jansen's "bump it with a trumpet" Mazeppa, Jessie Ladig's "do it with finesse" Tessie Tura, and Megan Love Warner's enlightening Electra. All the technical elements are spot-on, as per usual at BCT. Lots of set parts moving in and out (designed by Tiffany Fier), great choreography by Shannon Roberg, that big full pit orchestra that I love to see on these classic musicals with Anita Ruth at its helm, a large cast playing multiple roles, all under the direction of Zach Curtis. This is one of my favorite musical theater scores (music by Julie Styne and lyrics by Stephen Sondheim), with such great and memorable songs as "May We Entertain You," "You'll Never Get Away From Me," "Everything's Coming up Roses," "Together Wherever We Go," "You Gotta Get a Gimmick," and "All I Need is the Girl." Gypsy continues at Bloomington Civic Theater through May 25 (with discount tickets on Goldstar). If you've never seen this classic on stage, this is a great production to introduce you. And even if you've seen it many times, it's still fun to revisit old favorites. BCT has announced their 2014-2015 season and I'm super excited to see that they've chosen the brilliant new rock musical about a family dealing with mental illness, Next to Normal. I think it's great that they sometimes venture out of their comfort zone of classics that they do so well, which next season include Guys and Dolls, La Cage Aux Folles, and Carousel - one I've never seen but have been wanting to. But first - the final play this season is The Odd Couple, which I am going to see for two reasons - Sam Landman as Oscar and Wade Vaughn as Felix. Trust me, you don't want to miss these two.